I’m very excited to share the twenty-fourth episode of the Woolful podcast. 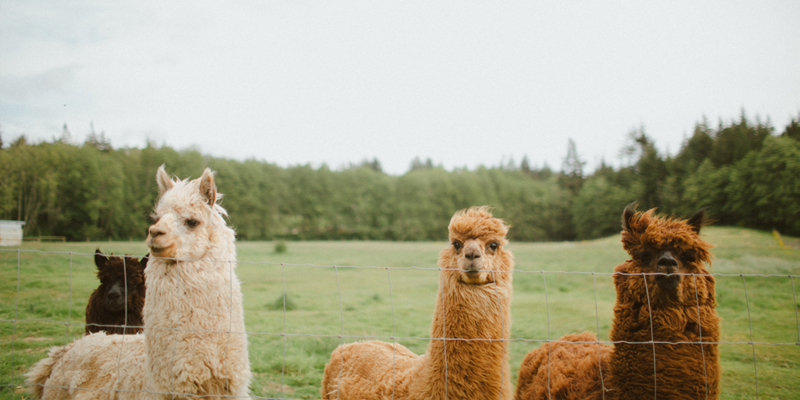 Today we get to meet a special woman, Hanahlie Beise who’s passion has led her to dive into the world of fiber, raising a herd of alpacas and creating her yarn, Hinterland. Sponsor: I wanted to thank one of our sponsors of this week’s episode, Tin Can Knits. 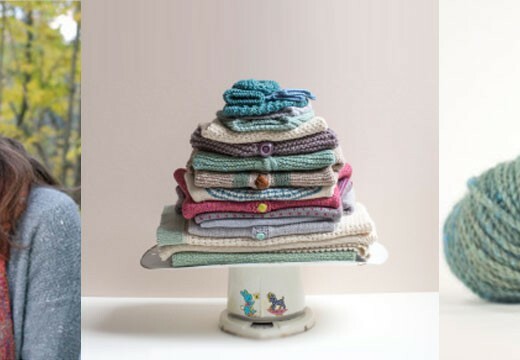 Alexa and Emily have created several endearing collections of modern, clearly written patterns that feature accessories and garments each sized for babies, all the way up to 4XL. I really love their Road Trip and Max and Bodhi’s Wardrobe collections, and hope to make the Fly Away blanket this Fall. 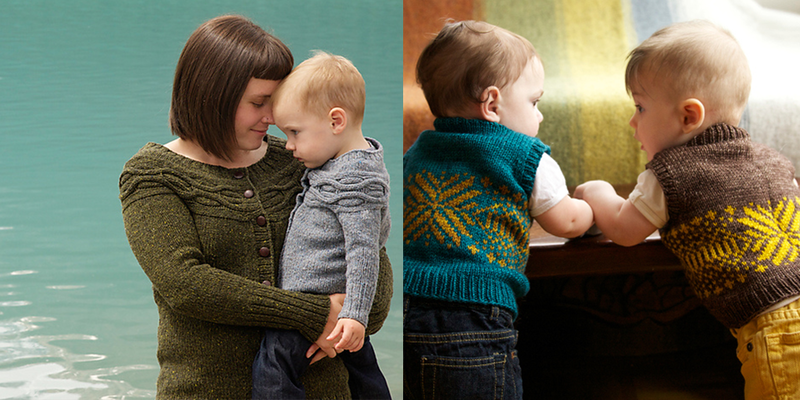 They’ll be releasing the final pattern of the Max and Bodhi’s Wardrobe collection on June 11th, so make sure to find this and their other collections on Ravelry and to keep up with all the going ons visit tincanknits.com. 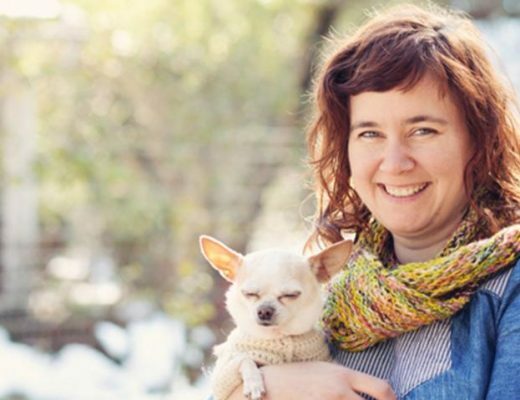 Fiber folk: I’ve had the pleasure of getting to know Hanahlie since before the podcast launched, when she reached out to share what she’s been up to, raising Alpacas in British Columbia and creating yarn from her fiber and fiber she sources from other North American farms. As I learned more about what she was up to, I was moved and asked Hanahlie if she’d be interested in selling me her yarn so that I could offer it in the Woolful Mercantile. What a special thing it is to create something from a yarn that was dreamed up and created by a now friend, a woman who’s heart is so kind and her determination to help the Canadian fiber industry, so inspiring. You can find Hanahlie at hinterlandfarm.ca and on Instagram @hinterland_textiles. Giveaway: The winner of last week’s giveaway, is Karen Latuchie! You’ve won the Moon Sprites hat pattern designed by Dianna Walla and three skeins of Lettlopi from Tolt Yarn and Wool. Congratulations! The giveaway this week is sponsored by yours trulyand my little shop, the Woolful Mercantile, and I’m giving away 3 skeins of Hinterland yarn, including two of the Targhee – Columbia – Rambouillet -Alpaca blend Ravine and a skein of the Churro Lopi, Cabin. To enter this giveaway, leave a comment in the comment section at the bottom of the post page here. Sponsor: I wanted to make sure and thank our second sponsor today, Knitterly…a special yarn shop created by Shelli Westcott, based in Petaluma California. I am always amazed at the well curated selection of yarns, fibers and classes Shelli works so hard to provide all us fiber enthusiasts. Make sure to visit when in Petaluma and online at shop.knitterly.net. This coming weekend on Saturday June 6th, Knitterly is hosting a workshop by Andrea Mowry of Dreareneeknits. As a part of the workshop you’ll get to learn from Andrea and you’ll also receive the entire Radius pattern collection. If you haven’t already listened to both Andrea and Shelli in episode 14, you really should. I hope to see you this Saturday at Knitterly! Now I want to visit an alpaca farm and hug all the fluffy alpacas! I so appreciate your guests of all your podcasts and this weeks’ guest, Hannahlie, was inspirational as well as interesting. Hats off to folks who rescue animals. Going from 6 animals to 46, without a doubt, took courage and kindness. I always enjoy your podcast, and your post on superwash wool completely transformed my relationship to knitting and has sent me off on a lot of local fibre-hunting adventures. Thank you. I feel really lucky to have been exposed to this way of thinking so early on in my knitting journey. It has been nice to see some Canadians interviewed on your podcast. As a Canadian overseas, I enjoy learning a bit about what is going on in my home country fibre-wise! yippeee! another great excuse to relax and listen!!! Can’t wait! Still trying to keep up with your wonderful podcast – can’t wait to listen to this episode! The Hinterland yarn looks absolutely beautiful. The hinterland yarn looks and sounds beautiful. I look forward to meeting you at Knitterly this weekend. I would love to have some luscious new yarn for my summer knitting! Super!!! Clue 3 or Purbeck tales MKAL and a new Woolful podcast in a same day!!! Thanks a lot! 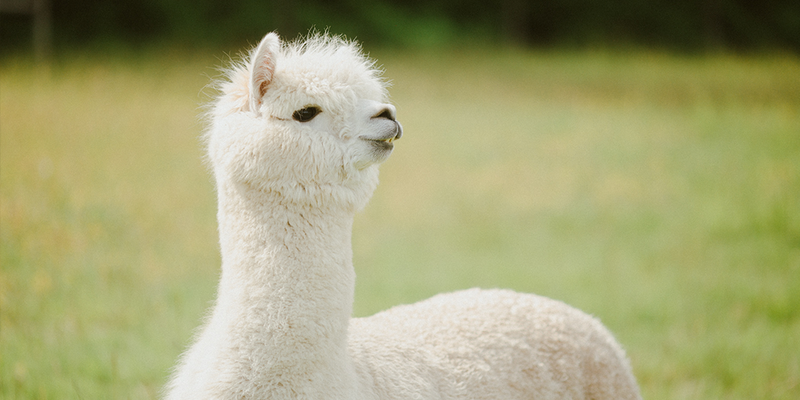 Great podcast and terrific pictures of the alpacas. I’d love to try the hinterland yarn. Alpaca is lovely and soft, I would love to win some of this yarn. Loving the podcasts, look forward to them every time! Thank you for the podcast. I would love to win some of your yarn, it is very nice! Would love to try any of those beautiful yarns. How lovely to hear the back story on the Ravine yarn! I’d love to try it some time. Hope I’m not too late to enter! I’ve never experienced alpaca fiber but have long wanted to. I’d love to win. And thank you for your podcasts- they are my favorite wind down from a crazy day indulgence! Hannahlie’s yarn sounds and looks heavenly. I would love to try the hinterland yarn, we have alpacas and I am finding that blending it with wool makes it more versatile, I believe there are sheep in our future as well! Thanks for such a great podcast. You’ve really inspired me to work toward having my own fiber farm one day. I also really like your new format of only interviewing one fiber folk per episode. Can’t wait to listen to this on the ride home!!! WOW that yarn looks wonderful. Looks like a dream to knit. Love the little vests as well. Thanks for the wonderful podcast. I love listening to it when I’m knitting. I live by myself and this is such a treat. Its like I’m sitting their with you while your talking about people’s lives. Thank you for the great podcast! I just found your podcast and am enjoying working my way through past episodes. It’s interesting to hear about the choices Hanalie Beise has made regarding the way she works with her alpacas & the fiber blends she chooses for her yarns. 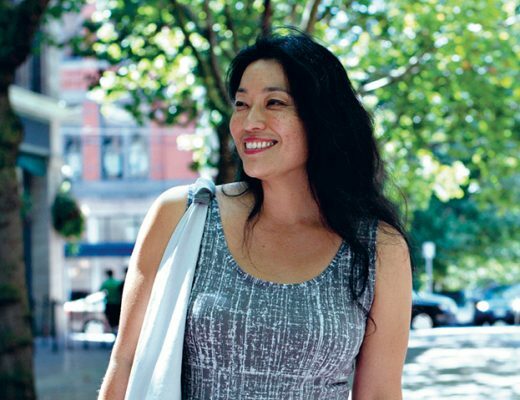 Also her passion for locally produced & sustainable fiber is inspiring! I ran across Woolful today on iTunes, and so this was the first one I listened to! I loved it so much that I immediately subscribed, and I really enjoy the wide range of wooly topics that you cover. Looking forward to making my way through the archives! Oh my goodness, I would love to try the Hinterland yarn!! Your wool looks wonderful! I’d love to work with it. SO happy to hear a shout out to MacAusland’s! I get to visit the mill whenever the mood strikes, and it is like stepping back in time in the very best way. Wonderful podcast, as always. Thank you for this effort. THIS NEW FORMAT IS VERY PLEASANT AS EACH FIBER FARMER AND MAKER IS FEATURED IN A MORE PERSONAL WAY.THANK FOR INTRODUCING YOUR FANS TO SUCH AN ECLECTIC ARRAY OF PRODUCERS.I WOULD SO APPRECIATE A WIN .DECONSTUCTING SWEATERS FOR YARN AT THIS POINT AND WOULD BE MORE THAN DELIGHTED TO RECEIVE A GENUINE SKEIN OF YARN.LOOKING FORWARD TO NEXT PODCAST. I love that Hanahlie mentioned the idea of fiber folk and animals working together in harmony to create something. Its such a primitive concept that I think is really beautiful. Such a great episode! Thank you! It was nice listening to Hanahlie’s journey in the fiber world. Another great episode. Would love to try your yarn! 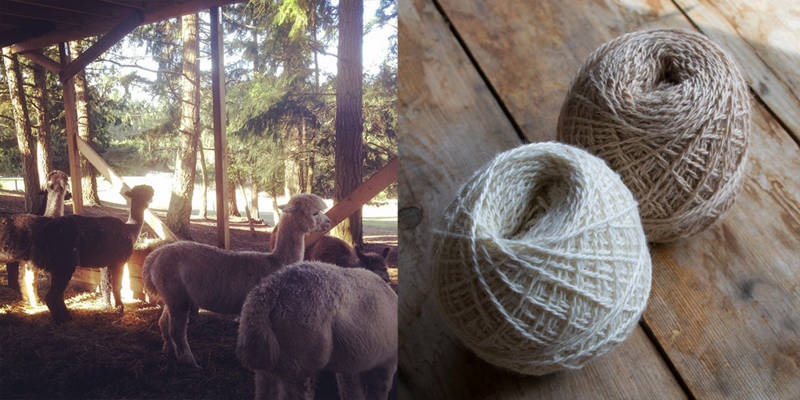 Alpacas sound like so much fun… the yarn is beautiful! Interested to hear the desirable mix of alpaca and wool. I have some alpaca fleeces as well as my own sheep’s fleeces; I will experiment with blending this summer. Love the episode and the podcast! Can’t wait to listen and knitting with that amazing yarn would be a blessing. I enjoyed this episode very much. Thanks for seeking out these wonderful people to interview. I enjoyed listening to Hanahlie’s stories about life on her farm. I LOVE the photos of her alpaca herd. They each look like they have unique & charming personalities. Like people! morels and alpacas, oh my! Thanks for bringing a little bit of BC to those of us who are far from there. Rambouillet-alpaca yarn? Smooth and bouncy? Curious! Another great podcast! As an alpaca and heritage sheep farmer myself, I am so heartened to hear more and more people are starting to take the fiber seriously. Hanahlie’s passions and goals are so similar to my own. I love that more small fiber farmers are collaborating and celebrating these unique and special animals! This is only the second time I’ve listened and I love your guests. Thanks! How appropriate to be listening as I spin some Canadian wool (Ontario Romney) dyed with sumac berries as I listen to the podcast. Would love to have the prize yarn come back to Canada! Can’t wait to listen, I’m still catching up! Oh what a wonderful episode. We just finished shearing our alpacas and I can’t wait to turn their fiber into beautiful yarn. I’d love to win this giveaway. I have recently befriended some sheep farmers that I would love to blend some of their wool with mine. I’d love to see the Hinterland yarn in real life! listening to your podcast, please enter me in tlhe drawing!! Yet another wonderful episode. It is so great to hear about more and more people working toward bringing the fiber industry back to North America. Thank you! I love your podcast. And I love to try new yarn. I’m going to manage these classic socks, thank you! I never do that but I always enjoy your podcast and the prize mthis week is so special !! So, fingers crossed ! Yes! Alpaca is very soft and is one of my favorite fibers for knitting sweaters. I’d love to invite some Alpakkas into my garden to have a party, oh sweetness! I loved hearing about Hanahlie’s journey. What a great find! Another great podcast, always inspiring and making me proud to be a fibre folk! Another wonderful podcast! Love to hear about the alpacas!! Great interview. Alpacas definitely make the cutest fiber farms, in my opinion. i just started listening to your podcast, and im totally addicted! 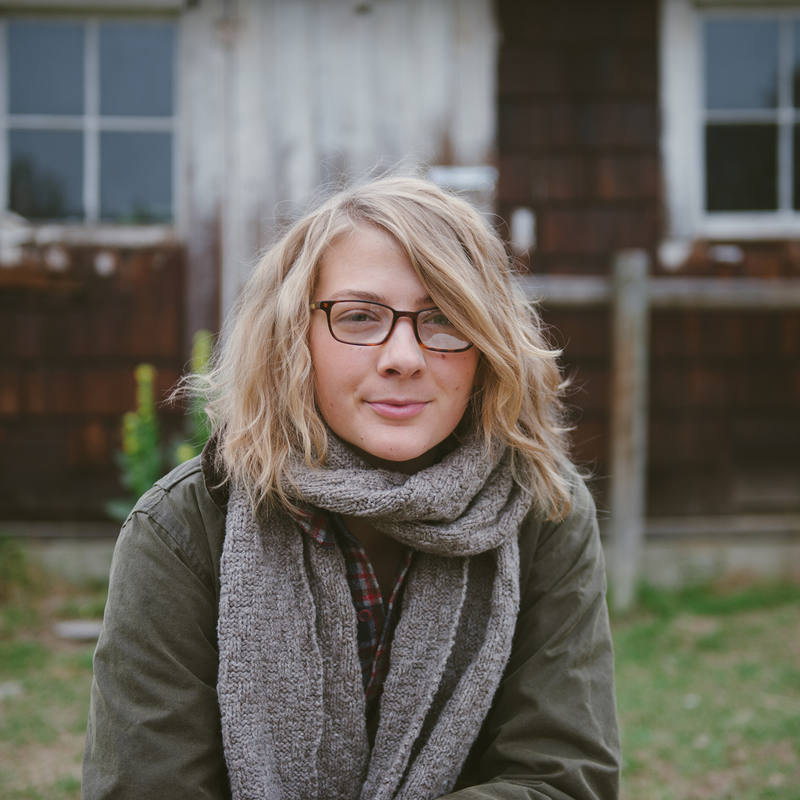 love hearing about all the small producers and yarn companies that are new to me….such a great resource and an amazing way to find out about so many fascinating people in this industry. Very inspiring! Thank you so much. you are always coming up with great heretofore-unknown-to-me fiber folk. Hinterland sounds awesome and I hope I win one of the yarns! I really, really want to win this! I look forward to listening to your podcast every time. I always find the people you interview fascinating and truly inspiring. Thank you. Adorable alpacas! I dream of a PNW coastal/island fibershed that goes from at least Northern California up to Prince Rupert, B.C. Thanks for more inspiration!! Would love to win Hinterland! Wonderful podcast! Amazing giveaway! I would love to add them to my stash! As of yet I haven’t listened to the latest podcast but that will happen asap. But I didn’t want to miss the chance of winning this giveaway. I would love to knit with some of your wool – it looks so very luscious. I loved listening to this interview. Now I’m really really curious about watching someone shear an alpaca…I’ve seen lots of sheep shearing demos. I adore Victoria and Vancouver Island, I have spent some great times and can see more great times If I can swing a chance to meet and see the lovely folks and animals !! Another awesome episode!! Sweet alpacas! Thank you again, Ashley! Such a joy. First time listener–such a pleasure! Can’t wait to hear more! Great podcast! Really loved the idea of growing own alpacas! As always I felt inspired after listening to your podcast. I have been thinking about raising a few alpacas for years now and think this upcoming year may finally be the right time to give it a go! Thank you for your wonderful addition to this community! Love your podcasts! They inspire me. I just started my first Tin Can Knits pattern — Harvest — and I can already tell I’ll be knitting more. She’s got some great patterns, and they’re so well put together. Glad to see them as a sponsor! Looking forward to learning a bit about alpacas. Lovely, Ashley! I look forward to listening to the new episode all week! Interesting as always. Alpacas are adorable!! I’ve only knitted with it once though, and it was 100%… would love to try it in a blend. I am not sure if I have used alpaca yarn. this would be terrific. Alpacas are the best!!!!!!!!!! Awesome episode. Looks like gorgeous yarn. Love your podcast! I would love to knit with Hinterland, and someday meet those beautiful alpacas! Inspired by you, as always. I had no idea about the sorry state of mills in my country. How do we turn this around? Where is the best place to spend our money? Who do we write letters to? Just downloaded this week’s podcast last night so looking forward to the morning drive! I loved hearing about Hanahlie’s fibre operation. Her yarn sounds lovely to work with and despite my overflowing stash I am looking forward to getting some of her yarn to try. I always want to support the Canadian fibre industry and find it quite frustrating that it can be quite limited for the average consumer. This was my first time listening to the podcast and I am so glad that it was suggested to me. I was at the local knit shop yesterday, and after hearing this podcast, I was more drawn to the alpaca yarn than ever before. I would love to try the hinterland! What an inspiring podcast. Great podcast as always, Ashley. I love alpaca yarn but especially when it’s blended with other yarns. The yarn blend in the giveaway sounds so interesting, not something you see at all. I especially love that none of the fibers are superwash. I wanted to add that I think it’s way more reasonable that you are now interviewing one person at a time. Your two person interviews were utterly delightful but I kept wondering how you were going to keep that going while raising a beautiful boy, working full-time, working your farm when you get to it and having an online shop. On top of that, sometimes I was overwhelmed by the beauty and inspiration bubbling out of me as I heard one and I didn’t think I could take another that was just as good as the first and it always was. My cup runneth over with just one, it was almost a transcendental experience sometimes. Too much!! So one person per podcast is plenty. Haha. I loved listening again. Hinterland’s yarn looks amazing and one I’d like to try. The episode has also inspired me to make time to spin more too. This was a very inspiring interview. I loved how just everything just came together for her and the alpacas! I would love to hear more about the dye garden! I’m so encouraged after listening to such creative movers and shakers on your podcast! I just bought 4 alpaca of my own, so this episode was especially inspiring for me to listen to. Looking forward to trying Hanahlie’s lovely yarn soon. I love alpacas, vicuñas, guanacos, and llamas! But, I also fear them when their ears are down . . . I loved this episode, I grew up near an alpaca farm and they’re wonderful animals! Great podcast! 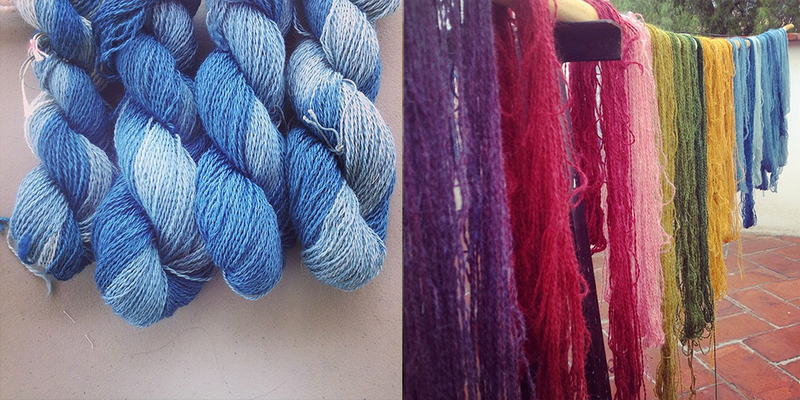 Hinterland’s yarn looks wonderful. Love the peak into the lives of other fiber folk. Working on my own sheep farm can be isolating at times…you bring to fiber community to me..thank you. Loved hearing about her different blends. 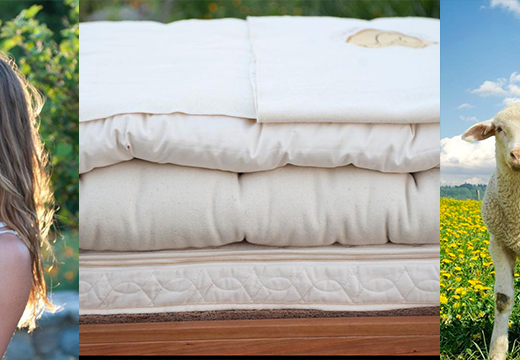 I use MacAusland’s in PEI for my blankets and besides the long turnaround time, they are great to work with! Highly recommended. As always, really enjoyed today’s podcast. 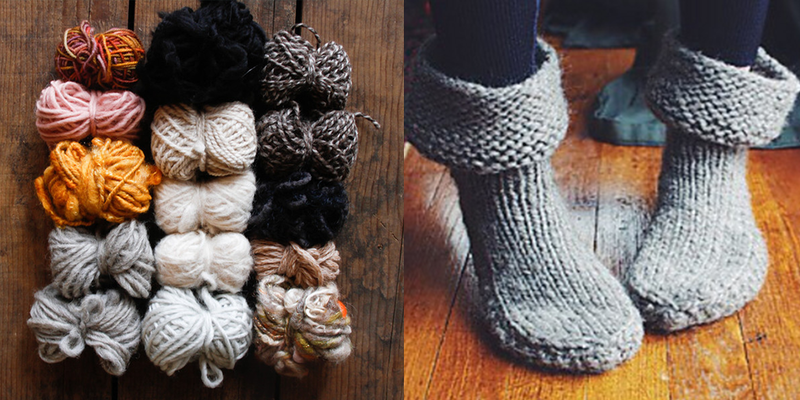 Would love to try out the hinterland yarn! So curious about navajo churro wool! Thanks for another inspiring podcast! Always nice to see some Canadians! 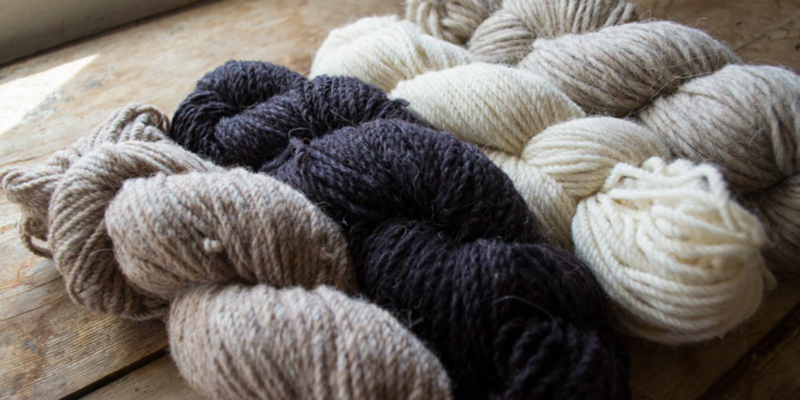 I have been drooling over that alpaca/rambo/targhee blend–it looks so squishy and wonderful!! I absolutely love this yarn, and have always been a huge fan of alpaca fiber. I’m only 14, but my lifelong goal is to have my own fiber farm, and everything you do is just reaffirming this. Thank you! Awesome podcast, thank you! Alpaca is one of my favourite fibres, I love knitting with it. Will definitely have to try Hinterland! I have been knitting less than two years. It is so much fun diving into this unknown territory. Just fascinating. It was great hearing about alpacas. My only experience with them, is a crazy one that lived in a paddock near me. He was a wee bit angry whenever you went past! Thanks for another great episode. I so love listening to your podcast every week! It truly inspires me! just found your podcast via Gridjunky on tumblr, can’t wait to listen. Thank you so much for creating this podcast, I have no idea how you got it in among raising children, sheep, and starting a wool mill: but it’s a wonderful part of my week. 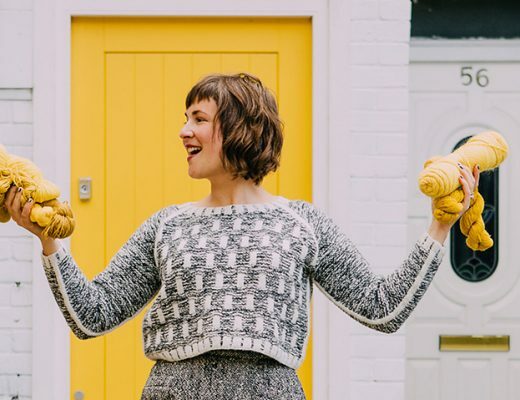 To have a podcast that actually talks about the aspects of knitting and wool that we all fell in love with, it’s a dream! Thank you! love all your podcasts! So inspiring! Hi Ashley, I love your podcasts. When I listen though, I often find myself reaching for the volume button. Even turned all the way up, I have trouble catching some of the words. I don’t have that problem with other podcasts. If at all possible, can you please increase the volume of the recordings? Thanks so much. This is so inspiring to hear how a passion and business grow together. Thank you for sharing your story. What great photo’s of the alpaca’s and the process of harvesting their fleece. I enjoyed hearing about how this week’s guest and her husband got into raising them. Thanks for the opportunity to win some of their yarn. Another inspiring podcast today! Didn’t want it to end. Dont’ think my last post made it on the page…hope this one does. Found your podcast via Gridjunky on tumblr. I’m a huge fan of alpaca yarn, and your podcast! Always inspiring to get aquainted with the artisan yarn producers and animal caretakers you interview. Thanks! Thanks for the podcast! It was great hearing from a small Canadian yarn company. I’m a huge fan of your podcast, and I’ve shared it with a number of fiber friends. Keep up the great work. I’m in awe of what you’re taking on and what you accomplish each week/season. Such beautiful animals and yarn!! A blend of alpaca and wool would be a delight to knit with!! And I’d love to try out that wool. Thank you for this podcast! I’ve learned so much. The yarn looks so lovely and warm. Thanks for the chance to be part of the drawing! Happy Knitting! Thank you for another podcast! Always enjoyable. I’m currently making a shawl out of the black Ravine Hinterland yarn and absolutely love it! Listening to the podcast and learning more about the farm and how the yarn came to be makes it even more special. I was so excited to listen to this episode and learn about a yarn producer thst is local to me (I also live on Vancouver Island). I can’t wait to try this yarn 🙂 Thanks for featuring some Canadian based folks on your podcast! Loved the podcast! I adore alpacas! 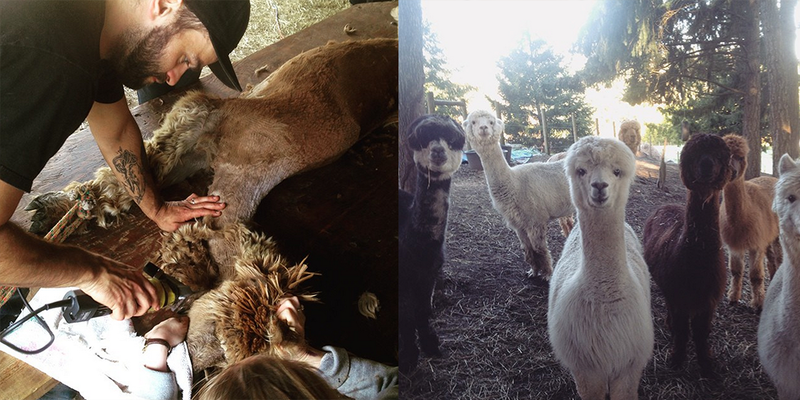 I have a friend with “rescue” alpacas – they are so cute and provide wonderful fiber! Alpaca fiber is my faaaaavorite! And those sweet faces are to die for. Those alpaca photos are so cute! Another great podcast! I’m excited to look for Hinterland Yarns. Sounds lovely. Thanks Ashley for giving us their story! This podcast was really great for me since my dream is to own( and learn to shear myself ) a few alpacas when I move to Vermont next year! Thank you for the great cast. Lovely podcast, so happy to hear about Canadian grown fibre. In headed to the island this week and will be in search of this wonderful yarn. Thanks for sharing! Love the earthy, farmy goodness of this yarn! Love the podcast! New to it, although I feel very attached to it already. Would love to have some of Hannahlie’s beautiful yarn, but really I would love to have a sheep of my own, so I could make my own beautiful yarn!! Someday. Love the rainbow of colors! Oh how I so enjoy your podcasts…….every.single.one! I would love to get to work with this yarn! I will be purchasing some at some point anyways- would love to support both you and Hannahile! I want to thank you for opening my eyes yet again to another fiber to try! You really have interviewed some amazing guests and Hannalie is no exception! Those pics of alpacas just make me smile!!! Looking forward to listening to this podcast. Alpacas really grow on you, and I’d love to try hinterland yarns! I just recently found your podcast and I am starting to go through all of the old episodes. I am learning so much about fiber and this community that I love. Thanks for such a great podcast! always exciting podcasts and giveaways. Beautiful! So good to hear! lovely podcast, now I want to move to Canada!